In October 2014 Mark O’Brien, a business manager in Xtrac’s commercial department, sadly passed away. Mark made a huge contribution to the business during his time at Xtrac and through his hard work and great personality was liked and respected throughout Xtrac and the entire industry. 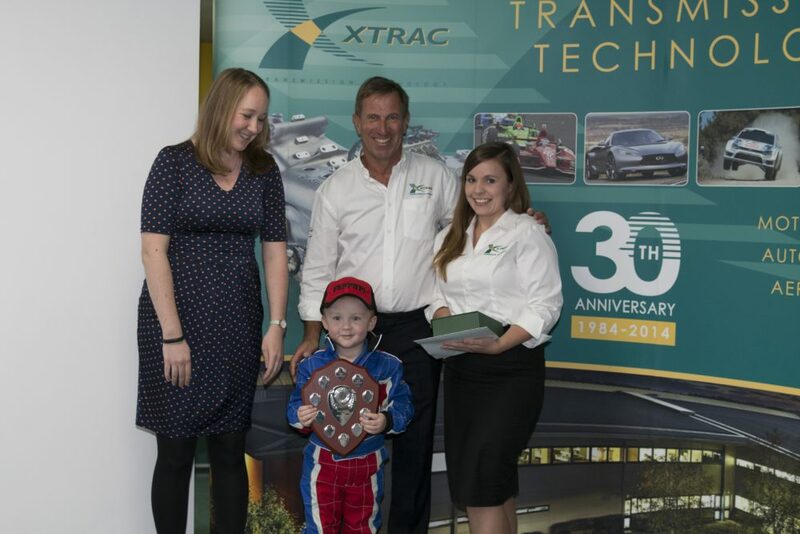 Xtrac proudly commemorate Mark’s life by presenting an award in his name and so, during a recent awards ceremony with all of the Xtrac employees, welcomed Mark’s wife Peta, his son Ethan and his parents David and Wendy to present the award for the second year. Nominees for the Mark O’Brien Award are employees supported by the company for a Bachelor’s Degree or higher or equivalent qualification. Consideration is given to academic progress, contribution to the business and the wider community, their personal development over the past 12 months, and their positive attitude in offering and implementing improvement ideas. This year there were 4 employees who were considered for this award. The winner for 2016 was Assistant Accountant Lynsey Dawson who joined Xtrac two years ago. Lynsey has become an integral part of the business, and has played a significant role in the development of the accounts department, and the contribution that the department makes; in particular across the operational and commercial aspects of our business. The 2016 runner up was Matt Booth, who since joining Xtrac has completed an apprenticeship and a Bachelor’s degree, and is currently studying for a Master’s degree. Matt is a Production Engineer working on many complex projects across Xtrac’s whole product range. The Darren Huttel award was presented for the tenth year in memory of former employee, Darren Huttel, who passed away suddenly aged 35 in September 2005. Darren had been with Xtrac for four years and worked in the build shop. His co-workers wanted to remember Darren and, given that he had started his career as an apprentice, it was felt appropriate to give the apprentice award in his name. All 11 Xtrac apprentices were considered as nominees, and voting was carried out by the Xtrac department managers, foreman and tutors at Newbury College, who oversee the apprentice training programme. Voting criteria takes into consideration the nominees conduct and performance at work and college, the quality of their college work and their overall performance and conduct. Xtrac’s long standing apprentice scheme has won many accolades since its inception in the early 1990s, with many of staff progressing onto senior roles within Xtrac and in the Industry. Applications for the September 2017 intake open in December 2016. The 2016 Darren Huttel Apprentice of the Year Award winner was Toby Mawson, who is a second year apprentice who joined Xtrac in 2015, and who is currently on his 15th month tour of the factory. The 2015 winner, Jamie Rusbridge, followed as joint runner up along with Arron Marshall. Managers Toby has worked with have been impressed with his willingness to go over and beyond and as a result he has become a real asset to the business. 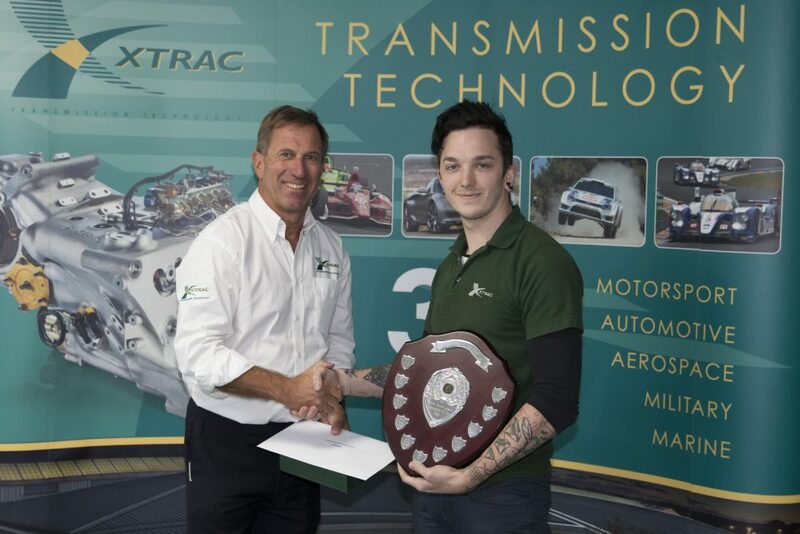 Following the Darren Huttel Award presentation, three apprentices, who have recently successfully completed their apprenticeships at Xtrac, were handed their certificates by Xtrac’s Chairman, Peter Digby. All three of them have been extremely dedicated to completing their studies and have worked very hard in order to take up full time positions with Frank Ibbottand Arron Marshall working as a CNC Grinders and Tim Plows as a CNC Turner. Xtrac are blessed in having a high majority of the staff who have served with the company for over 10 or 20 years with many now approaching 30 years of service. Gavin Ashton – Gearcutting, Grinding and Ratio Manager, Steve Hemmings – Quality Process Engineer, Grant Poe – Turning Team Leader and Paul Kent – Miller were all given 20 year service awards at the ceremony to rapturous applause from all of their friends and colleagues.